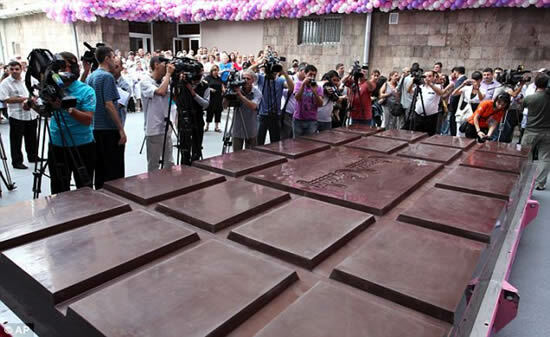 Switzerland and Belgium may be the world's most famous chocolate-making countries, but tiny Armenia has just stolen some of their spotlight by creating the largest chocolate bar, ever. The sweet event took place in Armenia's capital of Yerevan, and was organized by the Grand Candy Factory a local chocolate making company, as a way to celebrate to celebrate its 10 years of existence. Guinness Book representatives were invited to take part in the unveiling of the chocolate monster created, and to make sure this event goes into the record books. The previous record for the world's biggest chocolate bar was set in 2007, in Italy.